News / Design / Street life: how do you revive a dull urban area? Australia is 10 to 15 years behind modern thought in town development and building … We are not thinking in a big enough way – we are only heaping up difficulties for the future. Melbourne is a very dull-looking city. 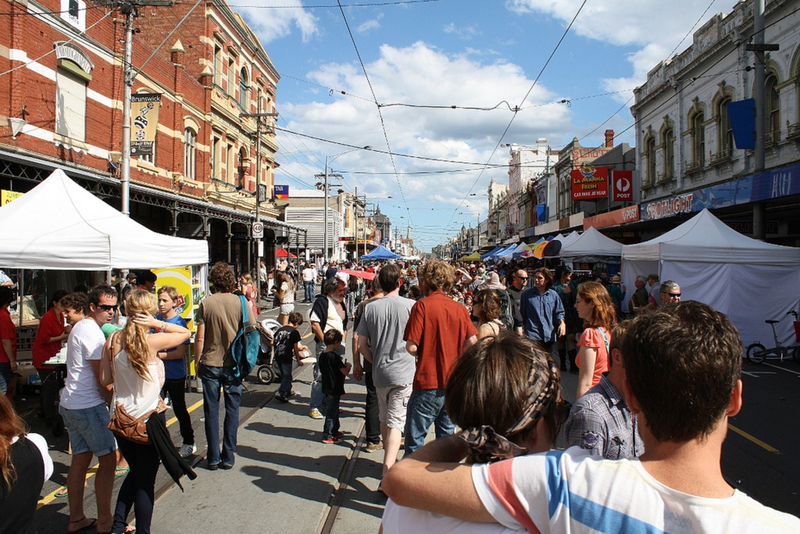 Why are there no roof cafes, no open street cafes in Melbourne? Earlier this month, the Victorian State Government published a blueprint for Melbourne’s Southbank Arts Precinct, then Danish architecture firm Gehl proposed major changes to the Melbourne Docklands. Both recommend “activating the street”. But how do you go about bringing a street to life in such a prescriptive fashion? Heath was a modernist, with all that entailed – belief in progress, technology and labour-saving devices. He lived till 1980; he might have just seen the very beginnings of Australia’s entry into the era of a genuine planning-based revival of the vital street. Suddenly, pot plants, trees, chairs and tables were on the footpaths, perhaps, and even street entertainment – all the things that, for most of the 20th century, had been seen as impediments to what streets were actually meant for: ease of speedy traffic, on wheels and/ or feet. The change (back) was inspired in large part by the legend of European (particularly, Mediterranean) street life and the writings of New York architectural writer Jane Jacobs, who celebrated the safe and satisfying life lived in public on the mixed-use city street. Streets live, die and return to life in remarkable ways. When Nicole Thibault opened her crafty second-hand shop Scrabble in the early 1990s on Ann Street in Brisbane’s West End, there was only one other business among the empty shopfronts: a gentleman’s club, The Red Garter. a Lone Ranger … for at least a year then a few other shops followed suit. Silver Rocket, Kleptomania, and Blonde Venus, Bent Books, were the main ones. By the time Thibault sold her business and left, Ann Street had become desirable retail again, and the area had revived. It was still noisy and dirty, but instead of a place to drive through it was a destination. The question is whether such stories are just component parts of an organic, demographic ebb and flow, or whether successful – that is, vibrant and attractive – streets can be made or remade. Drop into any major planned housing precinct – Springfield near Brisbane or Craigieburn in Melbourne’s north – and you’ll find the main shopping strip is designed to a human-scaled template, to encourage interaction, rest stops among street plantings, coffee breaks and quiet contemplation (or, at least, window shopping). Whether such blatant stabs at human-funnelling can ever really work is surely down to luck, happy accidents and geography – the last two basically no more than two more different kinds of luck. Yet it is often the fervent wish of retailers, city burghers and citizens that their main street, be it in a central business district or a prominent suburb, be brought to life in a manner that seems to fly the flag for a new wave not only of prosperity in itself but also diversity, variety, quirkiness even … and maybe ultimately just interestingness. The main shopping street presents a thorny problem because it is by definition a public space that needs people all the time – and a constantly renewing river of people – but it also needs certain areas to be marked out and set aside for certain functions. Antisocial behavior has to be policed, and indeed social behavior – stopping to chat – can in many instances be problematic, because it disturbs the flow, however delightfully. The perpetrators/ creators of shopping malls streamlined the customer delivery process perfectly, only to be told that customers had changed: now, they were looking for a simile of a bohemian village or a low-rise shopping experience. When I visited Queensland’s Springfield in 2011, the main shopping street ended in a billboard promising a lot more than the large mound of earth it was built to mask. Streets tend to work best when they go somewhere, even though most of the people using them won’t actually go where the street’s going. Instead, users thrive on the passing show of automobile traffic and the spectacle of each other. They’ll often, in fact, regard the automobiles with contempt: I have spent a lot of time on major shopping streets of both Sydney and Melbourne (I’m thinking King Street, Newtown and Sydney Road, Brunswick/ Coburg), each the beginning of a major highway heading to the other major city of Australia. I’ve noticed there is a cavalier, and proprietorial, attitude among users of both. People will blithely wander into traffic to get to the other side of the road, and the attitude seems to be (this was certainly how I felt when I used to do it) that the road isn’t for those cars passing through. It’s for the everyday local user, and sheer will throws up a forcefield to prevent any harm from the sometimes crawling, sometimes unpredictable stop-start, local traffic. Perhaps that, then, is the secret to an effective street: the sense (not necessary an illusion) that one is part of something bigger, that while on the one hand one is merely participating in flaneurie (the act of strolling), one is also part of the larger city organism, not just camping out in a backwater cul-de-sac. Surely the key to designing a vibrant street is incorporation into major developments or impressive backdrops. But an “impressive backdrop” is not just physical. 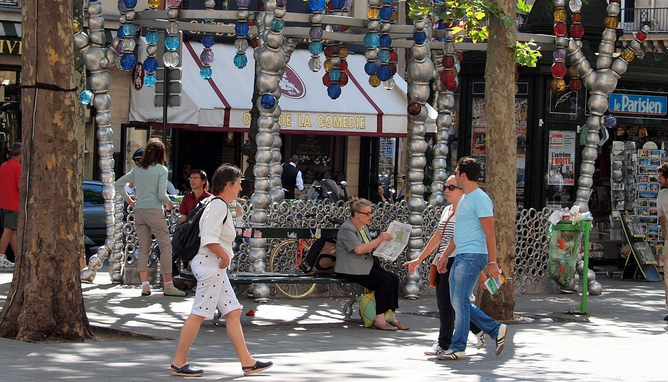 Streets can also be designed around cultural (ethnic or otherwise) hotspots or any other reason to make us think we’re not just Pavlov’s dogging it to capitalism’s sonorous bell, but also experiencing – in peripheral vision, in cross-cultural, cross-class encounters, and in atmosphere – something elevating and even educational. David Nichols does not work for, consult to, own shares in or receive funding from any company or organisation that would benefit from this article, and has no relevant affiliations.